More than anything Hedgie wants to be an astronaut and travel into space. He gets his chance the day the geyser, Big Sparkler, starts to sputter and fade, disappointing all the alien tourists, who fly to the tiny planet of Mikkop to throw coins into Big Sparkler and look at the strange flowers that survive on its sparkles. Because only Hedgie can fit into a small space ship, he flies to Mikkop, where he not only finds out what is clogging up Big Sparkler, but fixes the problem in a most unusual way. He returns home a hero amid cheers from the aliens and the scientists back at the Star Lab. 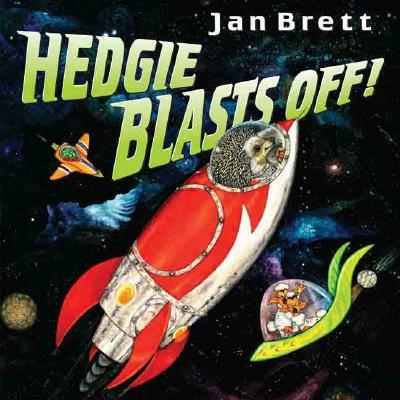 With an amazing gatefold illustration of Hedgie bursting out of Big Sparkler this is not only one of Jan Brett's most inventive books, but it's one of the funniest. Fans will love the unusual setting as they laugh along with a wild cast of characters, including comic aliens, canine scientists and bird reporters. So jump on a spaceship and take a ride to Big Sparkler. You'll be glad you made the trip!